Big Changes For This February! BHQ Design started out as a creative agency specialising in the Building Industry, our company has evolved into 3D Revolution and is intent on dominating the 3D Architectural Visualisation space with our beautiful 3D Photo Realistic Renders and our Realistic 3D and VR/AR Interactive Tours for Property Developers, Architects, Builders and Home Owners. We've got some BIG things happening here at 3D Revolution in 2019, with some exciting new VR services being developed to help our Unbuilt Property Developers sell their projects. We have just recruited another 5 expert 3D artists and are in the process of recruiting even more as our workload has quadrupled over the last few years, largely due to the repeat business from our clients and referrals THANK YOU! Over the next 12-18 months, we will be bringing on more localised Project Managers to work more closely with our clients to ensure that we continue to provide the superior service and quality of work that you are used to. We can still be reached via our bhqdesign.com.au email addresses but if you could please update our contacts to the below that would be appreciated. In among these changes we are still just as committed to providing the best end results to our clients. In fact we are working harder than ever! With the help of our new expert designers we have just had an incredible couple of weeks. Take a look at a few of our favorites for this month. Check out this new project our friends over at Aston Constructions plan to build in 2019. They have designed a contemporary set of two attached units that are both identical with 2 bedrooms, 2 bathrooms, a study, garage and an open living, dining and kitchen area that overlooks the pergola and backyard. Situated right near a school, hospital and sporting clubs, this project will be built on Stockdale Avenue in Bentleigh East - East Victoria. A family oriented residential area that is just over an hour away from Melbourne City. 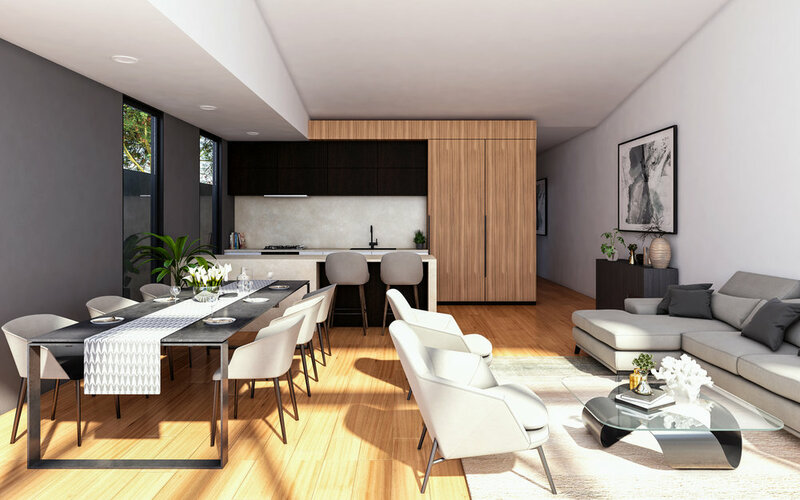 In assisting them to best express their project and get some high quality marketing materiel on the table, we provided Aston Construction with several 3D Renders. In the first image you can see the 3D interior render we provided of an amazing bathroom design that combines modern architecture with rich textures and an extremely effective use of natural lighting that does not intrude on privacy. Additionally we provided them with two 3D Exterior Renders that show both the front and back of the project and how what is effectively quite a small space has been created into a really modern and practical home. Further more we provided a 3D Interior of their open plan living, dining & kitchen area. A great addition to what was a a really great project to work on! 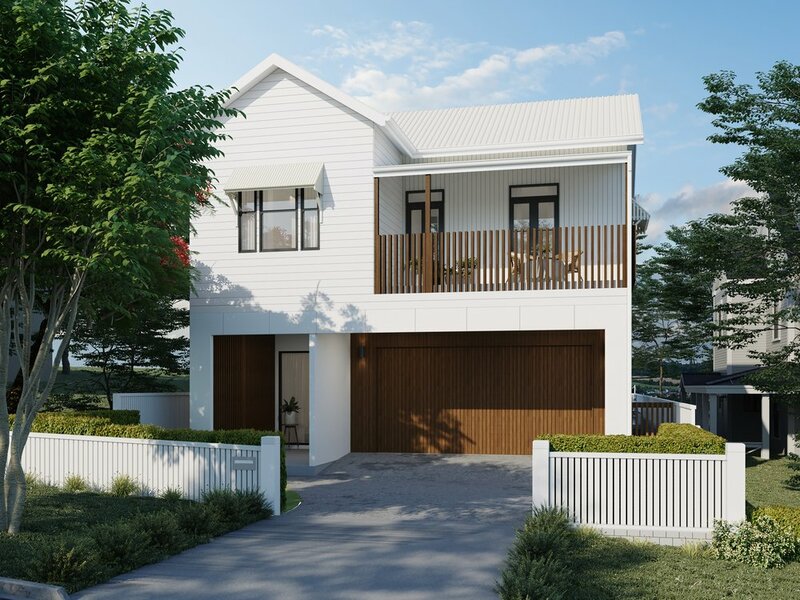 Frasers Property are creating this new multi level coastal home in Wynnum on the east coast of Brisbane. Their new project will include 4 bedrooms, 1 study, 2 bathrooms, 1 media room and a large open living, dining and kitchen area. The living area backs onto a balcony that overlooks the backyard and in ground swimming pool. To assist in the marketing and sales process, Fraser Property were in need of some 3D marketing Renders. We were more than happy to provide them with the amazing shot you see above, showcasing the front exterior and how it combines white panels & rendered brick with rich brown timber textures on the balustrade and window frames for a really effective finish. Below you can also see the render we created facing the rear facade from the backyard that includes the balcony and swimming pool. Additionally we provided a number of 3D Interior Renders that take you through the living area, main bedroom and en suite. Working closely with our clients we were able to combine their great interior design ideas with the use of special lighting effects to create a really amazing finish on the interior renders. Have a look at this new office fit out we assisted with that is being built within the city on Golbourne Street in Sydney. Located 12 stories high, this new professional office will house over 100 employee desks, several collaboration areas, 2 boardrooms, 3 meeting rooms, a games area and all other necessary employee facilities. Working with MPA Workspaces, we provided them with several 3D Interior Renders of the office, that shows off the main working floor, the entry and reception area as well as the staff kitchen. As can be seen above, we received some great feedback from our clients regarding this project, which is really great and is why we do what we do! Thanks for working with us MPA Workspaces, we hope you can put these marketing renders to good use!